The second appearance of the Coyote after his debut film ‘Fast and Furry-ous‘ (1949) was, surprisingly, not another Road Runner cartoon. 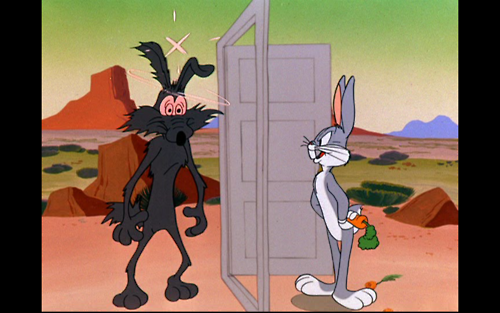 Instead, director Chuck Jones decided to place his still fresh carnivore character against Bugs Bunny, a character increasingly in need of worthy opponents. in ‘Operation: Rabbit’ Wile E. Coyote gets his name (in the Road Runner cartoons he’s never called that way). Wile E. introduces himself to Bugs as ‘genius’, and suddenly he is a talking character, speaking with an eloquent, vaguely British voice. The experiment is not successful. The coyote’s ability to speak floods the action with a lot of superfluous dialogue, and he almost totally lacks the sympathetic frustration so wonderfully demonstrated in the Road Runner cartoons. Moreover, there’s hardly any chemistry between the two overconfident characters, which leads to remarkably unfunny gags, with only the one involving a flying saucer being able to create a chuckle. Despite the shortcomings, Jones would make Bugs Bunny and Wile E. Coyote co-star in three more cartoons: ‘To Hare is Human’ (1956), ‘Rabbit’s Feat’ (1960), and ‘Compressed Hare’ (1961). Meanwhile the Coyote would have a much more interesting career in the Road Runner cartoons, with the second one, ‘Beep Beep’, appearing four months after ‘Operation Rabbit’.